Photos provided by the Frederick County Government; Wallace Montgomery & Associates; and Concrete General, Inc.
Driving through Maryland can be a breathtaking experience. That is, until you come to a bridge that makes you wonder if you haven’t driven back in time about 50+ years. Boyers Mill Road Bridge, located near the Town of New Market in Frederick County, Maryland, was a prime example of this. The original bridge, built in 1962, was outdated by today’s standards. A three-span steel and concrete bridge deck structure, it offered limited bridge width, poor horizontal and vertical alignment, and low weight restrictions. After more than 50 years of service, it needed to be replaced. 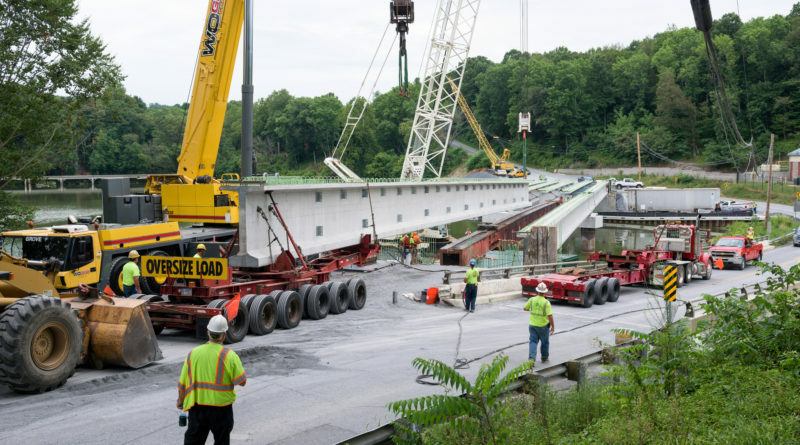 After receiving the Notice to Proceed for Project Construction the Frederick County Government Division of Public Works joined forces with General Contractor Concrete General, Inc. and Architect Wallace Montgomery & Associates to take on the challenge of replacing the bridge. And what a challenge it was! Replacing Boyers Mill Road Bridge offered a fair share of challenges including complicated site topography and geology. 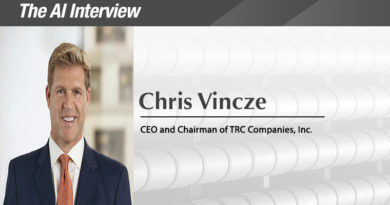 The site’s topography placed the original bridge at the bottom of a sag vertical curve, with grades of up to 13 percent at each approach point. To address this, the bridge was raised up by a full 20 feet at one approach point, and roadway lighting was added that improved sight distance and driver comfort. Likewise, the geology of the area offered varied rock elevations, requiring innovative solutions. 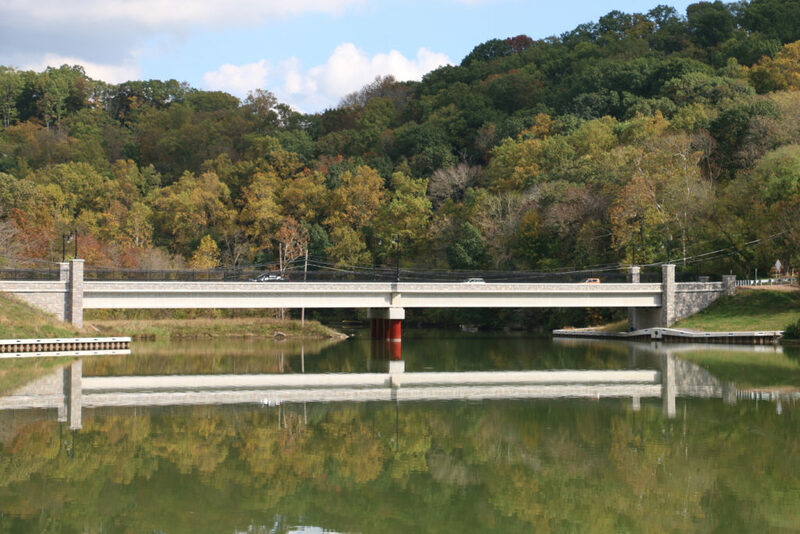 One such solution was to place 14 feet of fill material (riprap and stone) on the existing lake bottom, and to incorporate settlement plates and inclinometers into the bridge’s design. This ended up improving the bridge’s bearing capacity, eliminating 18,897 cubic yards of Select Borrow and over 8,000 cubic yards of Class 1 Excavation. 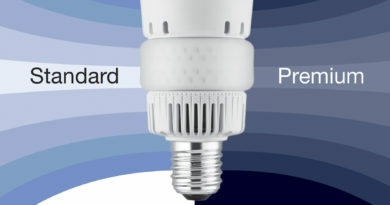 To top it all off, this saved Frederick County more than $470,000. 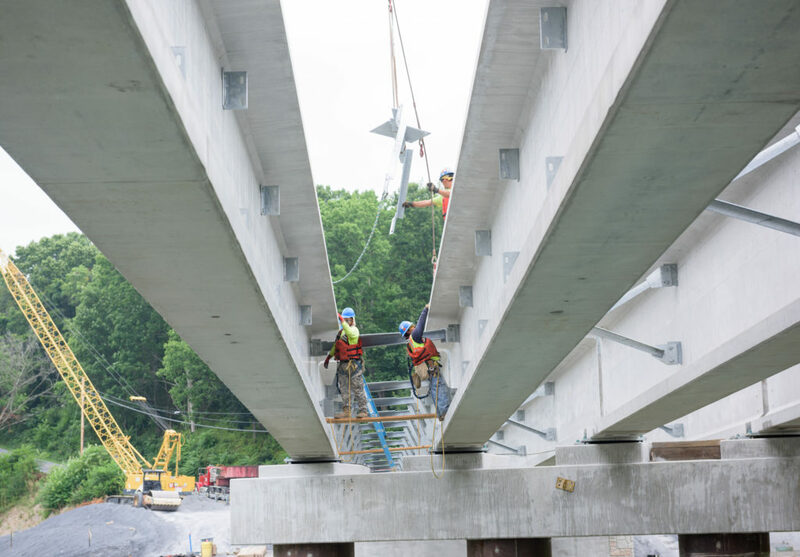 The new bridge boasts a visually appealing design that consists of a two-span, pre-stressed concrete Bulb-T superstructure and incorporates a concrete deck, sidewalks, ornamental railings, and concrete form liners. 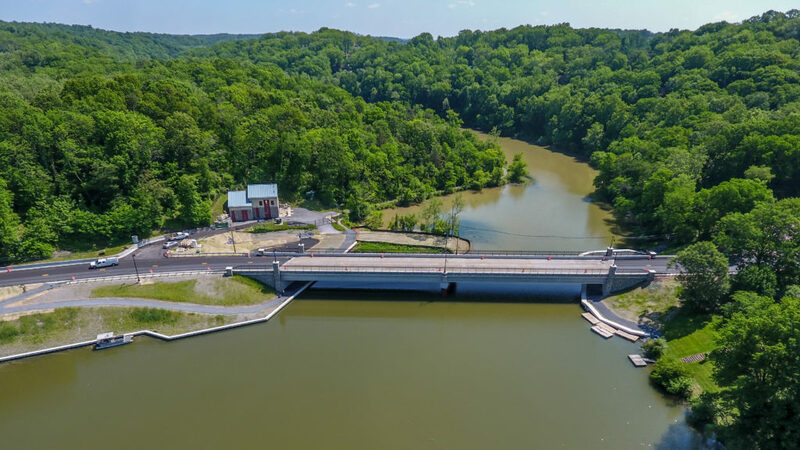 There were also environmental concerns to address, due to the fact that the bridge crosses over Lake Linganore, a privately owned lake that serves as a public drinking water source as well as a recreational resource to the local residents. This required coordination with the U.S. Fish and Wildlife Service, Maryland Department of Natural Resource’s (DNR) Wildlife and Heritage Division, and DNR’s Environmental Review Section, along with the U.S. Army Corps of Engineers (USACE) and Maryland Department of the Environment (MDE) to do the needed surveys and mapping, get the required permits, and ensure that no wildlife would be harmed in the making of this bridge. Thankfully, gaining funding was less of a challenge. 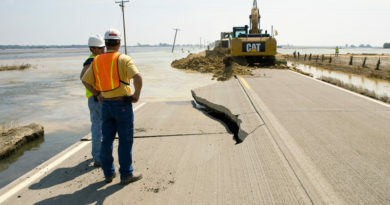 The bridge’s age, function, and overall structural condition made the replacement project eligible for funding though the Federal Highway Bridge Replacement Program. Incorporating federal funding into the project meant that construction was 80 percent federal aid eligible, meaning the County only had to provide for 20 percent of the construction costs. 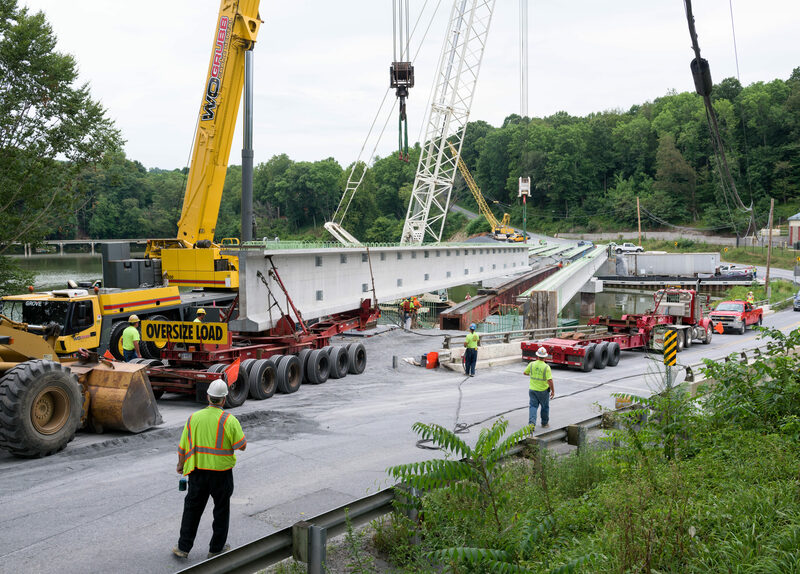 The bridge’s age, function, and overall structural condition made the replacement project eligible for funding though the Federal Highway Bridge Replacement Program. The new bridge boasts a visually appealing design that consists of a two-span, pre-stressed concrete Bulb-T superstructure and incorporates a concrete deck, sidewalks, ornamental railings, and concrete form liners. A bulkhead system was also designed and constructed to accommodate the construction and location of the abutments along the new bridge alignment. Other improvements included a new sidewalk for pedestrians, access to the community’s trail system that circumnavigates the lake, and inclusion of said trail system below the bridge. Low energy consuming roadway and pedestrian lighting was used to enhance pedestrian safety and meet design requirements. 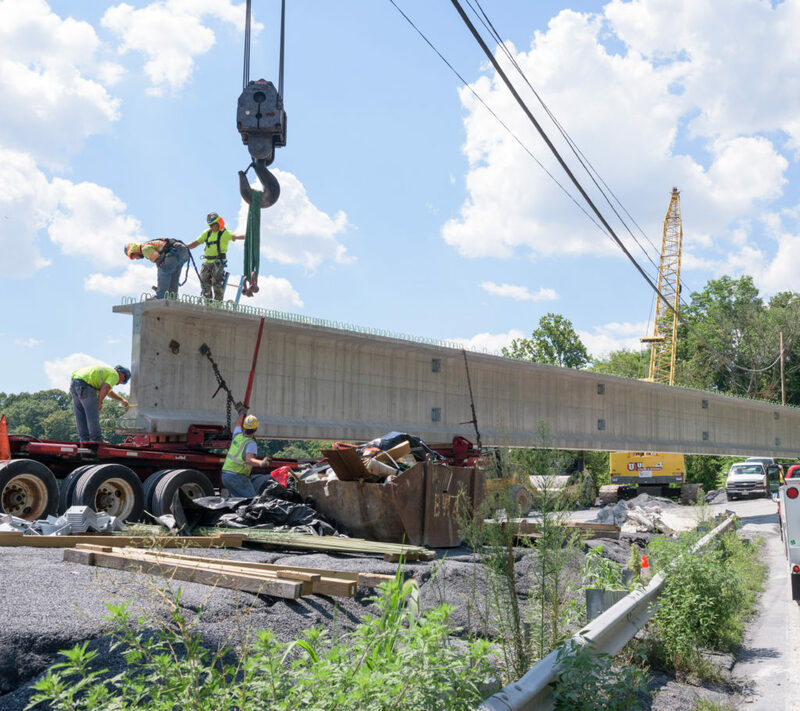 Additionally, in order to minimize lifecycle costs and maintenance needs, the project team decided to use precast concrete for the bridge’s superstructure and utilized 79-inch deep, PCEF bulb tee girders to accommodate the new bridge’s 150-foot spans. The Boyers Mill Road Bridge replacement project finished on May 24, 2017, almost exactly three years after it had begun.